Find Strasburg, CO Homes for sale. View Photos, Maps and MLS Data Now! Find your next home in the quiet setting in Strasburg and start making memories to last a lifetime. MLS#4302332. Keller Williams DTC. Wolf Creek Farms - Over 1500 sq ft in unfinished basement endless possibilities, make it your own. MLS#2999720. Home Bay Broker CO, Inc.
Coyote Ridge - Storage shed in yard. Come see your new home. MLS#4333033. TRUE COLORADO REALTY. Wolf Creek Farms - Proximity of the county maintenance facility usually results in roads being cleared soon after those occasional winter storms. MLS#8695944. Equity Colorado. This home will go quick so do not miss out on this great opportunity! 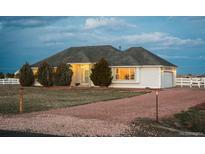 ***OPEN HOUSE Saturday 4/6 12:00-2:00PM MLS#3060176. EXIT Realty Denver Tech Center. Strasburg East - Sprinkler System For Front & Back Grass Areas. MLS#2810282. KENTWOOD REAL ESTATE DTC, LLC. No more city traffic! Truly special property. MLS#8716931. Boutique Homes LLC. Coyote Ridge - You will love the small town feel of Strasburg and still be close to DIA, Aurora and Denver. MLS#5302820. RE/MAX ACCORD. Enjoy your evenings on the huge back patio! MLS#2193389. EXIT Realty Denver Tech Center. Strasburg East - Open House this Saturday 11AM - 3PM MLS#7904248. EXIT Realty Cherry Creek. Strasburg East - Easy commute to Metro area, D.I.A., with all the Local amenities-King Soopers, Medical offices, Great Schools, Banks, Salons, Childcare, 24/7 fuel, Parks & More. MLS#8217394. HOME and LAND Realty. Comanche Crossing - Move-in-ready so come out and see it today! MLS#8649799. Total Concept Real Estate Services. Coyote Ridge - You will love living in your new friendly neighborhood within walking distance to all schools. MLS#8575633. COLDWELL BANKER RESIDENTIAL 24. Strasburg East - All this in a great family neighborhood and close to shops and highways! MLS#3112975. EXIT Realty Denver Tech Center. Strasburg East - There is also a workshop that can make a great word working workshop or Sharon's She Shed! MLS#6162424. Real Estate Connection, LLC. This home has been lovingly maintained and is ready to make someone very happy! Schedule your showing today!! ! MLS#5941881. Colorado Home Realty. Strasburg East - This Great Home Will Not Last Long! MLS#8260192. Modern Real Estate. Strasburg East - Unfinished basement is ready for your personal touch! Beautiful Home! MLS#7221486. TRELORA. Close to the park. Quick possession! MLS#3283156. Ion Real Estate Inc..
For a better view of the whole lot take a look at our drone footage under the film tab or play button on mobile! MLS#6686311. Brokers Guild-Cherry Creek Ltd..
Don't Wait This Home Will Not Last Long! ! MLS#4560677. STERLING REAL ESTATE GROUP INC.
Strasburg East - Sit on front porch swing, soak up some morning sun, and plan your day! MLS#1978489. COLDWELL BANKER RESIDENTIAL 24. This is one not to miss. MLS#8003418. Look East Realty. Strasburg East - This 40 acre home site can be your forever home! MLS#8017662. HILLSIDE COUNTRY HOMES & R.E..
Strasburg East - Adjacent To Open Field/Park. Call Today For More Info. MLS#4819038. HILLSIDE COUNTRY HOMES & R.E..